Protermosolar has estimated today at more than 2,000 million euros annually the extra cost receiving the hydraulic and nuclear technologies in Spain. A blistering attack on Spain’s solar thermal sector has earned Iberdrola expulsion from the industry body Protermosolar. Why has the world’s largest renewable energy operator gone sour on CSP? Spanning across the uninhabited desert landscape, the CSP plant will collect solar energy through a total mirror surface area of 130,000m2. The plant is an ISCC (Integrated Solar Combined Cycle) facility, which combines solar energy with a combined cycle gas plant, thus saving fuel and increasing the plant’s overall output. 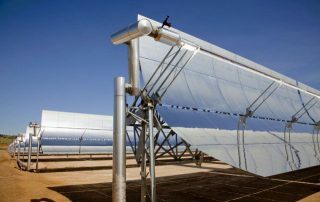 The Concentrating Solar Power plant in Kuraymat, an uninhabited flat desert area about 100 kilometers (60 miles) south of Cairo, will have a solar capacity of 20 megawatts.